Edith Churcher came from Suffolk to St Mary's Hall, to teach English in 1884. Having taught for 13 years she felt the call to go to China to assist missionary work. She went to Yang-Cheo and taught in the China Inland Mission School. Each year she sent back articles about her life in China to be printed in the Old Girls' magazine. In 1900 she was at Chefoo teaching the children of missionaries and they included boys to which she was not used! In 1901 she experienced the fear of a Boxer uprising in which "all foreigners were to be killed" but luckily the Mission compound was not attacked. The Consul was to raise 3 red flags if the inmates were in danger and had to flee downstream by boat. Whilst at Ying-Shan, Western China, she reported that all the Christian women had unbound their feet and the Christian men had ordered their children's feet to be unbound. She was sent to various Chinese towns to help the Mission work and at Kuang-yuan Sze-chuan she started a "Total Abstinence Society" to try and wean people off smoking opium. In 1907 she returned to St Mary's Hall on Furlough and attended the Founders' Day Service. By 1909 she was suffering severe attacks of rheumatism which grew worse. Eventually she returned to England and sadly in 1929 was knocked down by a car in Hastings, probably because her hearing and eyesight were poor and she was not used to "motorised vehicles". So a lady who had survived the privations of life in rural China from 1897-1927 succumbed to modern technology! Whilst writing this account an amazing coincidence happened. I was cleaning my loft and came across a book describing the life of 3 other lady missionaries in China in 1923-1926!! They were there at the same time as Edith but in different areas. 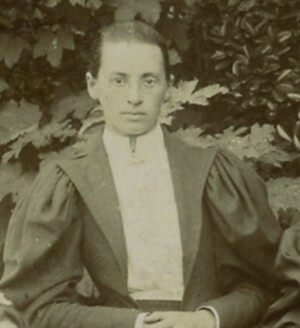 The research on Miss Churcher was prompted by the family who live in the house in Suffolk where Edith was brought up and wanted to know more about her. What a story! This page was added on 28/05/2008.